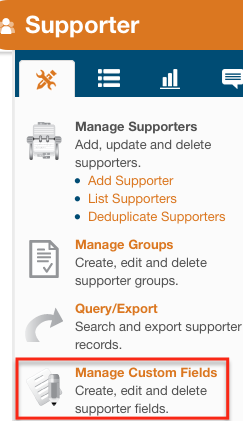 If you want to track certain kinds of data about your supporters, but you see no place in the standard Salsa database structure to store it, you can create custom fields to extend your supporter database. There is no limit to the number of custom fields that you can create. This will display a list of all of your custom fields. If you have not created any custom fields, this list will be empty. Otherwise, the list will display the following information for each custom field: Name. Field Type, API Name, amd Description. 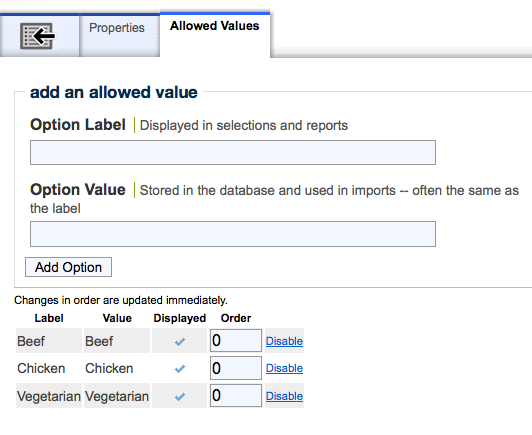 There are also buttons marked Edit and Delete which allow you to, respectively, edit and delete existing custom fields. The Reference Name will be the internal name of the field. When you type a name in this field, it will automatically appear in the API name field as well, edited to remove spaces. You shouldn't need to edit the API name (and should avoid doing so unless you have a good reason!). If you use Chapters within your organization, check the box for Expose to all chapters if you want the custom field to be available to all chapters. Finally, you will have to choose a Field Type for your new custom field. There are thirteen types of custom fields you can create. Examples of each type are provided, but you don't need to limit yourself to them--be creative with your data management. This type of field allows for the input of multiple lines of text but is smaller than Very Large Text (between 256 and 64,999 characters - right in between the One Line of Text and the Very Large Text limits). Example responses to open-ended questions like "What would you like to see added to our website?" This will appear as a large text area. It allows for the input of large amounts of text (>65,000 characters). Examples: responses to requests for long stories, like "Please tell us about a situation that requires our organization's attention" or "Tell your story: how did our work affect you?" This will appear as an input field that will only accept numbers. Decimal points and fractions are not allowed. You will be able to run queries on this field with conditions such as "equals," or "greater than/less than. Examples: : Number of Calls Made to Office; Membership Number; Work Address (Zip Code); Score from 2011 Bowling Fundraiser. NOTE: The 'Integer' field type can only store values up to '2147483647'. This means that it's not a good field type to use for some scenarios (Mobile Phone Numbers, for example). For data that extends beyond that value, again such as a Mobile Phone Number, you may consider using the VARCHAR data type. This type of field will display as a checkbox on a supporter record. A supporter will have a value of 1 (true/checked) or 0 (false/unchecked) for this field, denoted by the presence or absence of a check mark in the checkbox. Examples: Vegetarian (Y/N), Supports Our Big Issue (Yes/No), Graduated College (Yes/No). This will appear in Salsa in the format YYYY-MM-DD, and must also be in that format if you are importing data to this field. Choosing this type of custom field will not allow dates after 31 December 2037. Examples: Membership expiration date; join date; birthday; incident date. This will appear in Salsa in the format HH:MM:SS, and must also be in that format if you are importing data to this field. Examples: time of incident; time of contact. This will appear as two input fields. The larger one is for dates, which are recorded in Salsa in the format YYYY-MM-DD. The smaller field is for time, which is recorded in the format HH:MM:SS on a 24-hour clockChoosing this type of custom field will not allow dates before 1 January 1970 or after 31 December 2037. This works just like Date and Time, but includes Milliseconds for additional precision. Choosing this type of custom field will not allow dates before 1 January 1970 or after 31 December 2037. For when you've just got to have millisecond levels of precision in measuring stuff. This is the multiple choice option, which lets include you create different selections which will appear in a drop down menu. You will have to specify each of the possible options in an additional step. Learn more here. Examples: Entree chosen for fundraising dinner (chicken, fish, or tofu); marital status (married/partnership/single/divorced/widowed); employment status (full time/part time/student/unemployed). This is set up to specifically accept percentages in number form. This allows you create a specific field to hold monetary values. Examples: prices of items. Click Save to continue to the rest of the Properties tab. The Display in profile manager checkbox allows you to choose whether your supporters will be able to see and edit this field in their profile manager. This is assuming you encourage your supporters to actually access or edit their profile within Salsa. 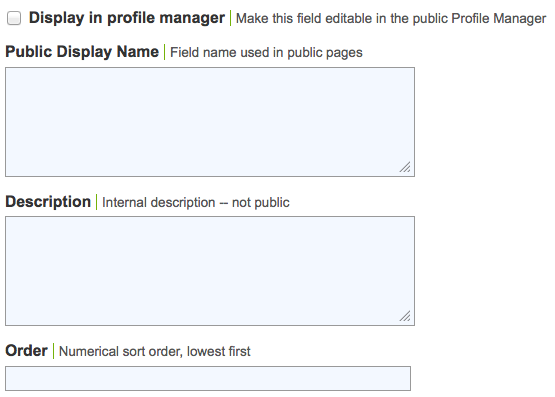 The Public Display Name is the name that will appear next to your custom field when you place it in public pages. For example, if you're asking people for their high school GPA and write "High School GPA" in this box, that's what they'll see when you include this field on a sign-up sheet or other web page. The Description is internal: here you can put notes on how your staff should interpret or use this field. It will not be visible to the public. Click Save again to finish setting up your custom field, which will now appear on the Custom Field List discussed before. If creating a PickList/List of Values custom field, there is an additional step of creating the options that will appear in your drop down menu. After finishing step two above and clicking Save, a tab will appear called Allowed Values. In order to complete the Picklist, it necessary to fill in both the Option Label and the Option Value for each of the options you want on the Picklist. TheOption Label is how the label will appear to your supporters, while the Option Value (which Salsa will fill out automatically) is how it will be stored in the database. You can also change the order of the options by entering numbers in the Order field. PickList options can not be edited and/or deleted after creation. However, you can permanently disable options through the "manage custom fields" interface, by selecting "edit" for your specific PickList. I'm wondering if a picklist can be assigned more than one value at a time by using the CTRL key. And if so, how would one import two values for a multi-value picklist? If not, how do I create a field with static options for which a manager can choose more than one option? This would allow people to choose, for example. Utah and Delaware but not Alabama. It's not as efficient as a single selectable list, but it's easier to implement on the database side and less prone to user error.If you need some assistance with customizing the order in which these fields are presented to the supporter, please let us know! Is there any way to add another profile category on the left menu with a series of additional custom fields, or can they only be found in the "Custom Fields" section? We have several custom fields we'd like to add (demographics, issue, involvement, etc) and it would must easier to manage if all of the custom fields were in specific categories, rather than all listed in the custom fields category. Thank you! to make managing custom fields a bit easier. If you have any other questions, please send a message to Salsa Support and we'll be glad to help out. Is it possible to add a custom field to a donation record rather than the supporter? How many characters can fit in a Multiple Lines of Text custom field? Between 256 and 64,999 characters. Below that amount, use One Line of Text, and above that amount use the Very Large Text type. Can an integer field contain dashes? We're trying to import ID's to Salsa from our database. IDS may have numbers with dashes. Would one line of text field be more appropriate? If these are auto-generated ID numbers and they're going straight from your DB to Salsa, I would use "one line of text." Integer types are looking for whole numbers - 1, 4, -435, but will ignore alphanumerics (like a dash in between) and decimal points. Questions about fixed fields in the basic profile (not custom): can I extend the character count in the Title field? Additionally, can I supply a checklist with multiple selections for the Occupations field? For the Title field, if you're just talking about viewing more characters in the Title field, if it can be done, it would only be particular to your browser using a browser plug-in that would let you force a different display on your computer only. If that is still desirable, I can do some rooting around to find the plug-in I'm thinking about. On a signup page, this could go into the "Content before the Submit button" box on the Other Text tab. I've created some custom fields but I can't get them to appear on my membership signup page as a user field under User Information. Any tips? Thanks. I have a custom field that I would like to edit to have allowed values. If I make this change, will that affect values already in this field? Unfortunately you cannot switch custom field types after they've been created. We should be able to help you move existing values over to a new field - can you contact support@salsalabs.com with more information about the fields you're using? I have created a custom field but when I try to add it to the user information form on our membership signup page it is not listed under custom fields. Have I missed something? Should this custom field be added some where else? I began contacting SALSA support on Monday of this week, did not get a real response until Wednesday (after I bumped the support ticket noting that the client needs this form updated by Friday morning). I did receive a well detailed response but had additional questions and have not heard back for almost 24 hours. I REALLY need some guidance here. Thank you for any help you can provide! Hi Susan - Thanks for your post and I'm sorry for the trouble on this. This is actually an issue unique to your membership pages, but we have your ticket up now, and I'll follow up there with more details as quickly as I can. Thank you again! Is there is a way to group custom fields? Either put them in other tabs or to just organize them in groups within the Custom Fields tab? We want to have custom fields for different kinds of supporters and it would be great to be able to easily visually differentiate. I saw that there was a question similar to this, but it was last year, so I wondered if this might have been updated. There are a few custom fields tabs. If you're talking about the list in the Manage Custom Fields area of Salsa, you can edit a custom field and assign each custom field a numeric value in the Order field. When each of the custom fields have a numeric value, they will be ordered in this list based on those values. Is there a limit to the number of custom fields that can be created in the Supporter table? Any new news regarding adding custom fields to the donation table? Thanks! Also, is there a way to make custom fields (or even standard fields) a required field? Is it possible on a picklist to make a certain value automatically selected by default? Mention that I suggested that you send the message and it will be forwarded to me for speedy handling.